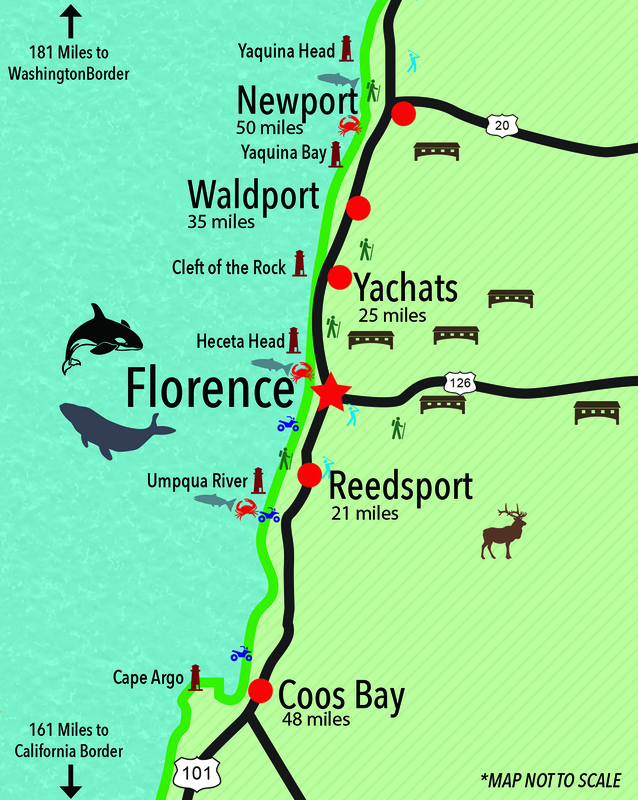 We are a short 5 minute walk to Heceta Beach. From there you can walk for miles on the beach. Bring a kite or hunt for agates, sea shells, or driftwood. A fishing village nestled along the Siuslaw River, Historic Old Town Florence offers picturesque and walkable riverfront, dining, galleries and shops. The most beautiful drive on the Oregon Coast is between Florence and Newport. Its only a 40 Mile drive, but will take 4 hours because the number of stops you will take to capture the stunning scenic views. A trip to the coast isn’t complete without stopping to view its historic lighthouses. Heceta Head Lighthouse, only 12 miles from Heceta Beach RV Park, is the most photographed in the country. 40 miles of dunes towering to 500 feet high along the coast, the Oregon Dunes are like no other. Bring your ATV, rent or book a tour. Enjoy Dungeness Crab fresh off the boat or catch your own from the public dock. Many guests of Heceta Beach RV Park come just for the Dungeness Crab. From Heceta Beach RV Park To Yachats, are some of the best beaches to find agates in the state because there are four creeks that empty here. From easy walks to adventure hikes, Heceta Beach RV Park draws tourists from around the world. Attracted to the region for its scenic beaches, waterfalls and rugged coast. Whether it’s deep sea or fresh water, Tuna, Salmon, Halibut or Trout, there’s always something to catch. On the central Oregon Coast, Florence is a sport fishermans dream. Enjoy horseback riding along rushing rivers, through lush green forests, over shifting sand dunes or across wide open beaches at sunset. You are in a win, win situation exploring Oregon’s many golf offerings. From scenic drives, fishing, hiking to historical landmarks, the beautiful Oregon Coast has so much to offer. There are so many things to do from Heceta Beach RV Park that you are going to want to make it an annual vacation stay. The Central Oregon Coast is known for rugged coastlines, peaceful beaches and abundant beauty; truly an infinite number of fun things to see and do! Here are Just a few ideas to help plan your stay.